Marmite chicken pops: a delicious and crunchy chicken snack! 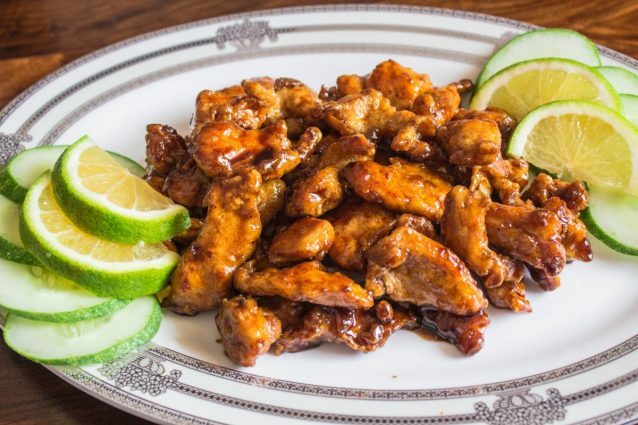 Marmite chicken pops is an incredible dish that has a sweet and slightly sour-ish kind of flavor in each bite. This, when coupled with the amazing crunch, is something that is decadent enough to floor all your friends and foes alike! Evenly cut the cleaned chicken breasts in to bite sized thin pieces and keep it aside in a bowl. In a non-stick pan, add the water, sugar, honey, marmite, soy sauce, half of the salt and bring everything to a boil on high heat. Simmer the sauce until it starts to thicken and then turn off the heat and keep it aside. Crack open the egg over the chicken slices and add black pepper to it. Mix everything well, cover, and refrigerate it for 20 minutes to marinate. Add the cornstarch to the chicken and mix it well. Heat the oil for frying and deep fry the chicken until they are crisp and golden in color. Add the fried chicken pieces to the marmite sauce present in the same pan in which it was cooked and mix it well so that the sauce coats the chicken pieces nicely. Now, turn on the heat and cook the chicken until the sauce becomes thick and sticky. Serve hot marmite chicken pops and enjoy! You may also use the fleshy legs to prepare this dish. Make sure that you carefully remove the egg shells while you break the egg. A wiser technique would be to break the egg in a separate bowl first and then use that broken egg for the recipe. You may marinate the chicken in the refrigerator for a minimum of 20 minutes or over night. You may also replace the water with chicken broth. If interested, you may bake the fried chicken in the marmite sauce at 180 degrees C for 15 to 20 minutes or until the chicken is crisp and well coated in the thick sauce.